NOVEMBER 2007 -- As I think about November and the dreary weather that often accompanies this season of the year, the question comes about keeping a positive approach to living in these dull days. The common answer that my experience tells me is to count your blessings and look forward to the brighter things to come. Grangers have the blessings of being able to effect the future through the strong legislative process which our founders set up and which we carry on today. 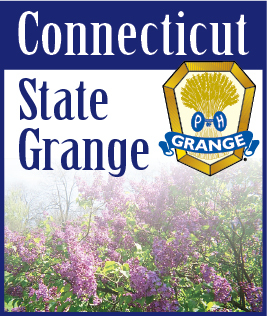 Other blessings we have are the strong friends we have in the Grange and the fact that a Granger can find interesting Grange meetings going on some place in the state almost every day of the month by checking out the notices in the Connecticut Granger and the listings of the web site www.ctstategrange.org on a friends computer or at your local library. In addition there is always the opportunity to help out with the maintenance of the New England Grange Building on the Eastern State Grounds in West Springfield MA. with the construction of items to be sold at the Big-E in next September. Finally, we can look forward to family meetings around Thanksgiving and Christmas. I pray that your November will be a joyous time in the year for you as we endure the dreary weather that November has a tendency to bring to people in New England and that your spirits will not be troubled by the difficult times which may come your way.